The Office of Federal Contract Compliance Programs issued a Notice of Proposed Rulemaking on December 9, 2011, proposing significant substantive changes to the regulations implementing Section 503 of the Rehabilitation Act of 1973, including the establishment of hiring goals for individuals with a disability. Secretary of Labor Hilda L. Solis hails the proposed rule as "one of the most significant advances in protecting the civil rights of workers with disabilities since the passage of the Americans with Disabilities Act." Patricia Shiu, Director of the OFCCP, said, "For nearly 40 years, the rules have said the contractors simply need to make a 'good faith' effort to recruit and hire people with disabilities. Clearly, that is not working. Our proposal would define specific goals, require real accountability, and provide the clearest possible guidance for employers seeking to comply with the law." The affirmative action plan development provisions of Section 503 of the Rehabilitation Act apply to federal contractors and subcontractors with a contract worth $50,000 or more and at least 50 employees. The OFCCP's most significant recommended change is to set a national utilization goal for individuals with a disability. According to the OFCCP, "A utilization goal is neither a hiring quota, nor a restrictive hiring ceiling. 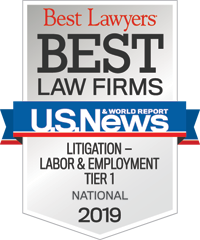 Rather, it is an equal employment opportunity objective, and an important tool for measuring the contractor's progress toward equal employment opportunity and assessing where barriers to equal employment opportunity remain." Citing the substantial discrepancy between workforce participation of individuals with a disability and their unemployment rates, the OFCCP states that mandating an "aspirational" goal is the best way to create accountability for contractors. Using the most recent data from the American Community Survey, the OFCCP determined that a national goal of 7 percent is appropriate. The agency specifically requests comment on using this 7 percent utilization goal, as well as a range between 4 percent and 10 percent. This utilization goal would apply to each job group in the contractor's workforce. Therefore, this is not a hiring goal, but is a "benchmark against which the contractor must measure the representation of individuals within each job group in its workforce." An annual utilization analysis by job group would be required, and when the percentage of individuals in one or more job groups is less than the 7 percent utilization goal, the contractor would be required to develop and execute "action-oriented" programs designed to correct any identified problem areas. This may include incorporating other suggested recruitment efforts set forth in the proposed regulations. (See "Recruitment Efforts" section below). The OFCCP states that it is also considering including (within the 7 percent goal) a "sub-goal" of 2 percent for individuals with severe or "targeted" disabilities, such as total deafness, blindness, missing extremities, and dwarfism. The agency specifically invites comments on the possibility of this sub-goal. • List all job openings with the nearest Employment One-Stop Career Center. • Enter into a linkage agreement with the nearest State Vocational Rehabilitation Agency or a local organization listed in the Social Security Administration's Ticket to Work Employment Network Directory. • Enter into a linkage agreement with at least one of several agencies for the purposes of recruitment and development of training opportunities. Possible agencies include the Employer Assistance and Resource Network (EARN), the regional office of the Department of Veterans Affairs, and local disability groups, among others. • Consult the Employer Resources section of the National Resource Directory, a partnership and online collaboration among the Departments of Labor, Defense, and Veterans Affairs, and establish a linkage agreement with at least one of the disabled veterans' service organizations listed. The agency also lists several suggested methods for additional outreach efforts, such as holding formal briefing sessions with recruiting sources and participating in work-study programs. Further, the OFCCP is proposing to require contractors to annually review their outreach and recruitment efforts to evaluate their effectiveness in identifying and recruiting qualified individuals with a disability. As part of this analysis, contractors must consider, at a minimum, the numbers of individuals with a disability who were referrals, applicants, and hires for the current year and two previous years. The OFCCP would determine whether the contractor's assessment of its efforts is reasonable, and the primary indicator of effectiveness will be whether individuals with a disability have been hired. If a contractor determines that its outreach efforts were not effective, it would be required to adopt one or more alternative efforts listed in the regulations. The OFCCP estimates that this annual assessment will take no more than 30 minutes per establishment. The proposed rule would require contractors to maintain all records relating to recruitment efforts for five years, which departs from the standard two-year retention period for most affirmative action records. • The number of referrals of individuals with a disability received from state employment services. • The number of referrals of individuals with a disability received from other entities with which the contractor has a linkage agreement. • The number of applicants who self-identified as an individual with a disability or who are otherwise known to be an individual with a disability. • The total number of job openings and total number of jobs filled. • The ratio of jobs filled to job openings. • The total number of applicants for all jobs. • The ratio of applicants with a disability to all applicants. • The number of applicants with a disability hired. • The total number of applicants hired. • The ratio of individuals with a disability hired to all individuals hired. Also of significant note, and although not included in draft form in the proposed regulations, the OFCCP is proposing to add a reporting mechanism that would require all contractors to provide this data directly to the agency on an annual basis. • The name and contact information for the official responsible for implementing the policy. • A statement that requests for accommodation may be oral or written and can be made by an applicant, an employee, or by a third party on someone else's behalf. • If the need for an accommodation is recurring (such as for a sign language interpreter), the individual does not have to make repeated requests each time the accommodation is needed. Requiring repeated submissions of such requests could be considered harassment on the basis of a disability. • Identification of the individuals to whom an accommodation request should be made. Requesters must be able to submit a request to any supervisor or manager in their chain of command or to the official responsible for implementing the policy. • Applicants must be made aware of the procedures and may request an accommodation to complete the application process; any such requests must be handled "expeditiously." • Contractors must provide written confirmation of receipt of a request for an accommodation, and such receipt must include the date the request was received and be signed by the authorized decisionmaker or designee. • Requests for accommodation must be processed "as expeditiously as possible." A contractor may set its own timeframe for completing the processing of requests, but if medical documentation is not necessary, the OFCCP proposes that the timeframe be no longer than 5 to 10 business days. However, if medical documentation is needed or special equipment must be ordered, then the agency suggests that 30 calendar days is sufficient. If the request cannot be processed within the established timeframe, the contractor would be required to provide written notice to the requester, which includes the reason for the delay and projected date of response. • A description of the steps the contractor takes when processing a reasonable accommodation request, including the process by which the contractor renders a final decision. If specific information must be provided to the contractor, the description must identify this information. • An explanation regarding when medical documentation may be requested by the contractor. • Any denial of a reasonable accommodation must be provided in writing and include the reason and be dated and signed by the authorized decisionmaker or designee. The denial must include a statement of the requester's right to file a discrimination complaint with the OFCCP. • All requests for accommodation and related documentation shall be treated confidentially. • Training must be provided to supervisors and managers responsible for implementing the reasonable accommodation procedures on an annual basis, as well as whenever significant changes are made to the contractor's reasonable accommodation procedures. The OFCCP estimates that development of this reasonable accommodation process will take contractors two hours. As anticipated, the OFCCP proposes to mandate that contractors invite all applicants to voluntarily self-identify as disabled during the application process. The OFCCP addresses previously raised concerns about the restrictions in the Americans with Disabilities Act on making pre-employment disability-related inquiries, noting that it does not prohibit federal contractors from collecting this information in furtherance of their affirmative action obligations. In support of its position, the agency cites the interpretation of the ADA issued by the U.S. Equal Employment Opportunity Commission. The self-id invitation may be included with application materials, but would be required to be detachable from the job application itself. Contractors would be forced to use language published by the OFCCP to reassure applicants that the request is required and routine. The OFCCP has included a proposed invitation and requests comments and suggestions on it. The agency does not propose that contractors ask applicants for information regarding specific types of disabilities, but only about the general existence of a disability. The OFCCP does not address the potential burden placed on contractors by the likely increase in disability-related claims from applicants. Applicants who self-identify as disabled are more likely to believe such information was a reason for their non-selection, and contractors will now lose the "but I didn't know" defense. The proposed regulations retain the requirement that contractors invite individuals to self-identify as disabled after an offer has been made, but before they begin working. The agency justifies this by acknowledging that individuals with hidden disabilities may fear discrimination if their disability is revealed before a job offer is made and that they should have an additional opportunity to provide "this valuable data." Despite being aware of this significant under-reporting problem, the OFCCP would require the invitation at the applicant stage because "it will provide the contractor and OFCCP with valuable information regarding the number of individuals with disabilities who apply for jobs with contractors. This data will enable OFCCP and the contractor to assess the effectiveness of the contractor's recruitment efforts over time, and to refine and improve the contractor's recruitment strategies, where necessary." In addition to the invitation to self-identify for applicants and new hires, the OFCCP is proposing that contractors survey their entire workforces once a year regarding whether the employees have disabilities. Again, the language to be used would be prescribed by the agency. The survey could be accomplished via paper or electronically, using the method generally preferred by the contractor to communicate with its employees. The survey responses must be kept confidential and maintained in a "data analysis file." Of course, this information must be provided to the OFCCP "upon request." The proposed rule would require contractors to include their affirmative action policies in their policy manuals and discuss the policies in orientation and management training programs. The OFCCP estimates that this dissemination requirement would add only 5 minutes to existing programs. If the contractor has a collective bargaining agreement, it would also be required to meet with union officials to inform them about the policy and seek their cooperation. Expanding on current training requirements, the OFCCP proposes specific training topics for individuals who implement personnel decisions. Such topics would include the business and societal benefits of employing individuals with a disability; appropriate sensitivity toward recruits, applicants, and employees with a disability; and the legal responsibilities of the contractor and its agents regarding individuals with a disability. The OFCCP estimates that this training requirement would add 20 minutes to existing training programs. An affirmative action program is a management tool designed to ensure equal employment opportunity and foster employment opportunities for individuals with disabilities. An affirmative action program institutionalizes the contractor's commitment to equality in every aspect of employment and is more than a paperwork exercise. Rather, an affirmative action program is dynamic in nature and includes measurable objectives, quantitative analyses, and internal auditing and reporting systems that measure the contractor's progress toward achieving equal employment opportunity for individuals with disabilities. Clearly, the OFCCP is attempting to breathe life into AAPs that frequently sit on contractors' shelves sight unseen, dusted off only when replaced by the annual update (which just sits on the shelf until . . . well, you get the picture). The OFCCP also proposes to clarify that the AAP must be reviewed and updated annually "by the official designated by the contractor" to implement the contractor's affirmative action activities. • Ensure information and communication technology is accessible to applicants and employees with disabilities and describe the review and any changes made in the written AAP. • For each employee with a disability, identify each promotion and training program for which the employee was considered. • When a disabled applicant or employee is rejected for employment, promotion, or training, prepare a statement of the reason and description of any accommodation considered. (The OFCCP's proposal does not state that this need only be done when the rejection is related to a disability). • Make records of accommodations provided to applicants and employees. • Review and update annually all physical and mental job requirements and maintain documentation of the same. The OFCCP would continue to require the posting of notices for applicants and employees, advising them of the contractor's obligation to take affirmative action to employ and advance qualified employees and applicants with a disability. The proposed rule clarifies that contractors must provide the notice in a form that is accessible and understandable to the individual applicant or employee by, for example, providing Braille or large print versions or posting at a lower height for visibility by a person in a wheelchair. The proposal would also require contractors to make the posting available to employees who do not work at the contractor's physical location. This requirement would be satisfied by an electronic posting, provided that the contractor provides computers that can access the posting, or the contractor has actual knowledge that employees are otherwise able to access the electronically posted notice. Further, the electronic notice would have to be posted in a conspicuous location and format on the contractor's intranet or emailed to employees. To satisfy the posting requirement with respect to internet applicants, contractors would also have to provide an electronic notice that is conspicuously stored with or as part of the electronic application. The proposed regulations continue to require that contractors make their AAPs available to employees, but add a provision that a contractor with employees who do not work at a physical establishment inform such employees about the availability of the AAP by a means other than a posting at its establishment. In another entirely new proposal, the OFCCP seeks to encourage contractors to voluntarily develop and implement programs that provide priority consideration to individuals with a disability in recruitment and/or hiring. The OFCCP maintains that providing priority consideration to individuals with a disability does not violate the ADA or Section 503 because both state that the basis for a discrimination claim cannot be the lack of a disability. In other words, there is no such thing as a "reverse discrimination" claim under the ADA or Section 503 of the Rehabilitation Act. (However, it appears that this is included in these statutes not to mandate "affirmative action" for disabled candidates but to allow employers to make reasonable accommodations without incurring the risk of reverse discrimination claims from non-disabled employees who do not need reasonable accommodations.) An example of priority consideration is "assigning a weighted value or additional 'points' to job applicants who self-identify as being an individual with a disability." The OFCCP is proposing that contracting agencies and federal contractors include the entire EO clause verbatim in federal contracts and subcontracts. The OFCCP suggests that this will help to ensure subcontractors are aware of their obligations. The agency proposes to amend the regulations to provide that it may extend the temporal scope of the desk audit (in other words, the time frame for which information is sought) if the agency "deems it necessary to carry out its investigation of potential violations." Characterized by the agency as a "clarification," this is a significant departure from the existing regulations, notwithstanding the OFCCP's internal "policy." The OFCCP proposes significant changes to definitions, terminology, and substantive provisions to conform to changes wrought by the Americans with Disabilities Act Amendments Act passed in 2008. These revisions do not appear to be controversial and are not likely to be challenged. • By mail to Debra A. Carr, Director, Division of Policy, Planning, and Program Development, Office of Federal Contract Compliance Programs, Room C-3325, 200 Constitution Avenue NW, Washington, D.C. 20210. Constangy will continue to monitor the increased regulatory activity of the OFCCP and alert you as soon as any changes are approved. Please contact any member of Constangy's Strategic Affirmative Action Practice Group or the Constangy attorney of your choice regarding these or other activities at the OFCCP. Also, for a more detailed discussion about these Proposed Regulations and other OFCCP developments, please join us for our Strategic Affirmative Action webinar series on January 12 or 18, 2012. Our e-blast notification for these sessions will be going out soon, so stay tuned!